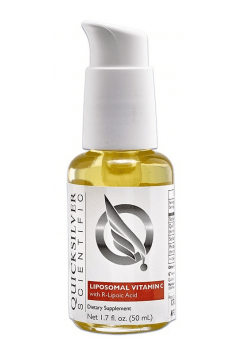 Quicksilver, Vitamin C With R-Lipoic Acid a dietary supplement in the liquid form, containing vitamin C (in the form of sodium ascorbate) and alpha-lipoic acid in the form of liposomes and nanoemulsion. Thanks to exceptional technology Quicksilver's Delivery Systems, active substances contained in the preparation exceptionally effectively reach target places and phospholipids, of which liposomes are made, have additional positive influence in the form of cell membrane nourishment, facilitation of nutrient absorption and better elimination of metabolic products and toxins. Vitamin C (ascorbic acid) demonstrates anticancer, cardioprotective, neuroprotective effects and strengthens immunity. It is a strong antioxidant which “sweeps away” free radicals, thanks to which it counteracts oxidative stress and consequently – decreases the risk of diseases, which are directly or indirectly related (i.a. cancers, atherosclerosis, Parkinson’s disease, Alzheimer’s disease, rheumatism, ulcerative colitis). Vitamin C is also a cofactor in the process of steroid hormone production, collagen, adrenaline and moreover, it contributes to better absorption of calcium and iron from the digestive tract. In the preparation, sodium salt of L-ascorbic acid was used – sodium ascorbate, which contrary to pure ascorbic acid, is characterized by lower level of acidity, thanks to which it does not cause undesirable gastrointestinal side-effects and is better tolerated by people with gastrointestinal hypersensitivity. Alpha-lipoic acid is a strong antioxidant. It both directly and indirectly (stimulates regeneration of antioxidants, e.g. vitamin C, E, glutathione) influences the reduction of free radicals. Moreover, it influences proper metabolism of carbohydrates and lipids. Alpha-lipoic acid also demonstrates the ability to bind heavy metals (such as for example copper, manganese, lead, zinc). Chelating of metal ions may contribute to decreasing oxidative stress in the organism. Moreover, it neutralizes heavy metals (limits their absorption from the digestive system, facilitates their excretion from kidneys and increases their elimination with bile), thanks to which it may counteract negative effects of poisonings, i.a. lead, arsenic, cadmium or mercury. Alpha-lipoic acid also demonstrates hypoglycemic and antioxidant effect in diabetes (it counteracts insulin-resistance), has immunomodulating effect, supports the therapy of hypertension (normalizes blood pressure) and mitigates side-effects of chemotherapy. Moreover, as a cofactor of many mitochondrial dehydrogenases, it is essential for the proper functioning of mitochondria (it increases efficiency of ATP and NADH synthesis), thanks to which it increases energy supplies in the organism, counteracts fatigue and alleviates the symptoms related to mitochondrial dysfunction and may turn out to be exceptionally helpful in case of e.g. glaucomatous optic neuropathy. Alpha-lipoic acid, closed in the form of a liposome, has the ability to permeate brain-blood barrier, thanks to which it may reach the majority of tissues of the organism. Both vitamin C and alpha-lipoic acid provided with food or traditional dietary supplements are characterized with small stability and even the majority of them, before they reach the target places, undergo many processes, which lead to losses. Liposomal technology is very helpful in this case, as it enables effective transport of many substances, both hydrophilic and lipophilic. Liposomes are closed plasmalemmal structures in the form of vesicles surrounded by a lipid bilayer. The structure of the liposomal encasement is analogous to biological membranes, thanks to which it constitutes a safe carrier of substances contained inside and guarantees protection from the activity of digestive processes, releasing the active substance only in the target place. An additional advantage is the fact that in such a form even high doses of vitamin C may be applied without a laxative effect. To sum up, Quicksilver, Vitamin C With R-Lipoic Acid is a dietary supplement which strengthens antioxidant barrier of the organism. Thanks to the content of substances with strong antioxidant potential, it counteracts the main civilization diseases related to oxidative stress. It is primarily recommended in case of increased susceptibility to infections (the fall-winter season), excessive exposure to stress and hard physical work or intensive trainings. Exceptional, liposomal formula of the supplement makes it suitable for people with gastrointestinal hypersensitivity. The preparation may be also applied topically. Thanks to applying the technology Quicksilver's Delivery Systems, active substances may also permeate skin layer.